Biography of American Impressionist Landscape Painter. 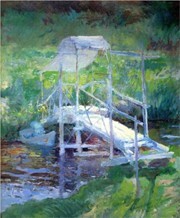 Best known for his Impressionist landscape painting, John H Twachtman was a member of "The Ten", a loose-knit group of American painters from Boston and New York, who were interested in Impressionism and who exhibited together 1898-1919 in opposition to the more conservative Society of American Artists. He was the most consistently and continually admired of all the major exponents of American Impressionism, and his work is still highly regarded for its experimental and personal nature. Like Theodore Robinson (1852-96), Twachtman died quite young, and his fellow artists of The Ten American Painters wrote sincere tributes to him which were published in the North American Review in 1903. Major historians of American art of the late 19th and early 20th century who wrote articles or short monographs about Twachtman, include Richard Boyle, Duncan Phillips, Forbes Watson, Eliot Clark, Charles De Kay and the artist-critic Allen Tucker. Twachtman's landscape painting was sensitively studied by John Douglass Hale in an unpublished Ph.D. dissertation in 1957 which included a catalogue raisonne, rare for an artist of this period in America, and more recent writers often single out Twachtman as the most sensitive and original of the American Impressionists. Twachtman's most famous Impressionist paintings include: Windmills, Dordrecht (1881, Cincinnati Art Museum); Arques-la-Bataille (1885, Metropolitan Museum of Art, New York); Springtime (c.1885, Cincinnati Art Museum); Icebound (1888-89, Art Institute of Chicago); Winter Harmony (1890/1900, National Gallery of Art, Washington DC); and Wild Cherry Tree (1901, Albright-Knox Art Gallery, New York). Other exponents of late-19th century Impressionism in America included: Mary Cassatt (1845-1926), William Merritt Chase (1849-1916), Theodore Robinson (1852-96), J. Alden Weir (1852-1919), John Singer Sargent (1856-1925) and Childe Hassam (1859-1935). Twachtman's background and artistic development are unusual among Impressionist painters from America, though many other late 19th-century painters followed the same pattern of training that Twachtman did, notably artists from Cincinnati and the Midwest. He was born in that Ohio city, a centre of German-American culture to which he was exposed, and was a product of the "Golden Age of Cincinnati Art," (c.1870-90). The city had long been regarded as "The Athens of the West," with art organizations and academies such as the Ohio Mechanics Institute and the McMicken School of Design. Twachtman attended the former and then transferred to the McMicken in 1871. He met the Munich-trained Frank Duveneck, who was back home in Cincinnati in 1874, and began to study with him. Though Duveneck's work did not meet with great success in Cincinnati, it attracted a great deal of favourable attention in Boston where some of his pictures were shown in 1875, and attempts were made to persuade him to remain there. Duveneck, however, was intent on returning to Munich, and with him went a number of young Cincinnati art students seeking broader experience and more solid training than could be found in Cincinnati, or even in America. Twachtman was among these, and included also were the future Indian painter Henry Farny and the able but short-lived sculptor Franz Dengler. Twachtman studied at the Academy of Fine Arts in Munich from 1875 to 1877 under the sympathetic friend of Duveneck, Ludwig Loefftz; he also worked at Polling where many artists who evinced a preference for landscape painted. For how it started, see: Impressionism: Origins & Influences. For details of the artists, see: Impressionism: Early History. In 1877 Twachtman went to Venice with Duveneck and Chase, and he sent two paintings back to the first exhibition of the Society of American Artists in New York in 1878. Twachtman's early manner is characteristic of the more progressive tendencies of Munich at this period: rough but dramatic painting featuring very bravura brushwork and strongly contrasting tones with an emphasis upon rich blacks. Subjects were interpreted in a deliberately unsentimental, informal and untraditional manner, and this is true also of Twachtman's interpretations of Venice, which exhibit a preference for the reality of the local inhabitants presented in an almost shorthand manner, rather than the tourist-oriented emphasis upon gorgeous architecture illuminated by limpid sunlight. Pictures of this nature helped reinforce critical estimation that the Society of American Artists was at first not only foreign-oriented but directed more toward Munich than toward Paris. Such pictures by Twachtman are the antithesis of his later Impressionist painting, and demonstrate the artist's range and the degree of change that occurred in the development of his modern art during this time. On the death of his father, Twachtman returned to Cincinnati, but finding the artistic climate still oriented more toward subject genre painting, he travelled to New York City towards the end of 1878, where he painted the harbour in a manner not dissimilar from his previous Venice scenes. In the seminal article that appeared in The American Art Review in 1881, "Cincinnati Artists of the Munich School," George McLaughlin categorized Twachtman as a marine painter. In 1880 Twachtman was back home teaching, but the pull of New York remained strong, and he returned; his friendship with J. Alden Weir was developing, and their painting styles were often to be associated in the minds of critics and patrons, and in public exhibitions as well. In the fall of 1880, Twachtman was back in Europe joining Duveneck in Florence as one of the "Duveneck Boys." The following year he returned to Cincinnati to be married, and then he and his wife, with Weir and several other artists, travelled through Europe. At this time Twachtman was exposed to a variety of influences, meeting the Hague School artist Anton Mauve (1838-88) and the plein-air painting expert Jules Bastien-Lepage (1848-84) before returning to Cincinnati in 1882. It was then, also, that Twachtman, along with the critics, came to the realization that he had carried the Munich manner as far as he could. The following year, financed by his father-in-law, he went to Paris to study at the Academie Julian with Boulanger and Lefebvre. Although he studied figure painting there, he was to paint only a few not especially successful figure works later in his career. More significant were the friendships he developed at the time with the Paris-oriented artists such as Robert Reid, Frank W Benson (1862-1951), Edmund Tarbell (1862-1938), Childe Hassam and Willard Metcalf (1853-1925), a group which became the basis of The Ten American Painters. He spent his summers painting landscape, at Arques-le-Bataille near Dieppe, and at Honfleur. These French works mark Twachtman's second manner, a short period in the mid-1880s during which many historians believe Twachtman produced some of his finest paintings. They are markedly different from his Munich work. They are thinly, rather than thickly painted; they are based on close and subtle rather than dramatic tonal relationships, and a distinct, limited range of colour which emphasizes grey-green tones prevails; and there is a tremendous sense of near-abstract design which in its flatness and asymmetry suggests a strong derivation from the Ukiyo-e Woodblock Prints of the fashionable Japonism movement - either directly learned or drawn from Whistler, for the paintings are markedly Whistlerian in mood and technique. Both Duncan Phillips and Forbes Watson were later to stress the influence of Whistler, and another critic stated that Twachtman painted days as Whistler painted nights. One of these works, Windmills, won the Webb prize for the finest landscape by an artist under forty at the Society of American Artists in 1888. For more about Impressionism, see: Characteristics of Impressionist Painting 1870-1910. Twachtman rejoined Duveneck in Venice in the winter of 1885, and he became closer to Robert Blum (1857-1903), another Cincinnati-born artist, there. A further connection with Whistler, and with Blum and Weir also, was Twachtman's increasing practice of pastel drawing. Blum was the guiding spirit of the pastel revival in America in the 1880s, and Twachtman was to exhibit some of his Venice pastels at the Wunderlich galleries in the second exhibition of the "Painters in Pastel", in 1888. Critics described Twachtman's pastels as comparable to Whistler's, both artists making abundant use of the tone of the coloured paper and the sketchy nature of the chalks. For details, see: Impressionist Exhibitions in Paris (1874-86). Twachtman was back in America in 1886, this time for good. It was at this time that his association with Weir became a close camaraderie. In 1887 Twachtman rented land at Branchville, near Weir, and in 1887-88 he purchased a 17-acre farm at nearby Cos Cob, where they often worked together. Twachtman also began teaching at the Art Students' League, which he continued for the rest of his life. He was an influential teacher, numbering among his students such later Impressionists as Ernest Lawson (1873-1939) and Allen Tucker (1866-1939), and two of his students, Tucker and Caroline Mase, wrote critical essays about his work. Twachtman's work began to be exhibited more regularly at this time also; he and Weir had a two-artist show in 1889 at the Ortgies Art Galleries on Fifth Avenue in which they each showed 42 works. They met with critical success, though Weir always sold better than his friend. Twachtman had a one-man show at the Wunderlich galleries in 1891, and was included in a four-artist show at the American Art Association in 1893, joining Weir, and the Frenchmen Claude Monet and Albert Besnard. By this time, Twachtman had abandoned his French manner in favour of his best known and most typical approach to landscape painting, sometimes referred to as his Greenwich style, and an aesthetic related to Impressionism. Art critics quickly recognized this, though at first some were confused by it. In the 1893 show, unsympathetic writers recognized at least grudgingly the originality of Monet's work, but felt that Weir and Twachtman were only imitators without even the force of the original master. Twachtman's development in his mature work is difficult to follow and assess, for he almost never dated his works, and even the year he began this phase of his painting is unclear. However, it has been demonstrated recently that one of Twachtman's finest, most original and most typical works of this period, his Icebound in the collection of the Art Institute of Chicago, was in all likelihood painted in the winter of 1888-89. Therefore, one may state with some confidence that this new manner must have begun about 1888. Other works can occasionally be given a tentative date either by exhibition records or by geographic locations, but Twachtman's tendency to repeat titles and to continue to paint the same subject over a period of years makes such methodology only partially reliable. The subjects of Twachtman's landscapes were, for the most part, his home and the land around it, and such local features as Horseneck Brook and the Blue Brook waterfall, or that favoured artists' meeting place, the Old Holley House in Cos Cob. (See his picture of the latter in the Cincinnati Art Museum.) Twachtman's great achievement lay in his ability to project his emotional response to these scenes, which are not at all spectacular in themselves. He painted the same subjects over and over again, in different lights and at different seasons. Such a procedure would seem to reflect Monet's contemporaneous manner in his series of haystacks and cathedrals, but Twachtman's interest was not in the recording of changing natural phenomena but in a very personal, subjective response. In effect, his art offered satisfaction to the critics who deplored Impressionism not for its rejection of traditional discipline but because it rejected sentiment and soul. Twachtman's method was certainly not that of orthodox Impressionism, but it drew upon its aesthetics. His paint became heavier and grittier than the thin washes of his French years. He built up his forms with thick, impastoed layers of paint and then glazed them over and over again, allowing the glazes to dry and bleach in the sunlight, thus creating the impression of a misty veil of luminosity and atmosphere. Yet, a strong sense of abstract design remained, and in some of his work the reduction of form to an almost two dimensional design of landscape forms bound by snaking, whip-like outlines almost anticipates the linearism of Art Nouveau. Horizon lines are often extremely high in his paintings and sometimes disappear completely, so that the viewer is forced to read the painting as a two dimensional surface design, since illusionistic space is at least partially eliminated. The sense of abstract art is reinforced by the square format that Twachtman often chose for his paintings; in fact, Twachtman appears to have painted more square paintings than any other American, though this conscious artistic choice was echoed by such European contemporaries as the Austrian Gustav Klimt, and some of Twachtman's younger American admirers, such as Marsden Hartley (1877-1943), followed suit in the succeeding decades. Like Childe Hassam, Twachtman emerged in the last decade of the 19th century as one of the major painters of the winter landscape, though Twachtman's were always country rather than city - part of what Hassam referred to as the "Cos Cob Clapboard School," emphasizing the rural nature of the art of the painters working in the area. 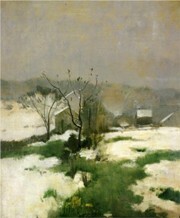 Unlike his French contemporaries, Twachtman's winter pictures are often monochromatic, with the overall whiteness only very subtly flecked with colour, rather than the more prismatic winter scenes of orthodox Impressionism, as exemplified in the paintings of Alfred Sisley (1839-1899), Camille Pissarro (1830-1903) and Claude Monet. Twachtman summed up beautifully his attitude toward nature, and especially the winter season, in a letter to his friend Weir. He said: "I can see how necessary it is to live always in the country - at all seasons of the year. Never is nature more lovely than when it is snowing. Everything is so quiet and the whole earth seems wrapped in a mantle... All nature is hushed to silence." and: Impressionists Renoir, Sisley, Pissarro, Degas, Cezanne. Small waterfalls and pools are often incorporated into his compositions, and add shimmering qualities to the lightness and airiness of Twachtman's landscapes. Though Twachtman made use of broken colour, his application of the brush was not overly systematic, and his closer, more nuanced tones are allied to the work of the Tonalists and of his friend Weir, projecting an intimacy similar to theirs and to the late work of George Innes (1825-94). Twachtman's painting is limited even within the thematic scope of landscape. The works seldom portray full sunlight, and he was never a painter of nocturnal scenes. He preferred the various aspects of winter, a full snow scene or the melting of snow at the end of winter, yet the verdant seasons of spring and summer appear beautifully also, though the riot of autumnal colouration was not agreeable to his aesthetic. He generally preferred a closed-in view rather than the panoramic, and the quiet flow of water seems to have produced a more genuine response than did a dramatic torrent. He was not a still life painter, but his close-up views of flowers growing in gardens are thematically akin to Hassam's work on Appledore, even less botanical and more moving; Charles De Kay praised these particularly, as flower painting only surpassed by the still lifes of John La Farge (1835-1910). The fragility, asymmetry and sense of abstraction drew much critical comparison with Oriental art. Christian Brinton recognized a similarity with Japanese art when a large group of Twachtman's works, including many flower pictures, was shown at the Panama-Pacific Exposition in San Francisco in 1915. Brinton saw in these paintings the essentials of Impressionism combined with the subtle abstraction of Japanese art, and Marsden Hartley recognized Japanese qualities in the flat planes and rhythmical shapes of Twachtman's landscape design. On the other hand, Sheldon Cheney, in The Story of Modern Art, identified Twachtman's source as being Chinese painters, and other writers saw the inspiration of Zen Buddhism. This last was the conclusion of John Laurvik in the catalogue of the San Francisco Exposition, and of John Cournos a year earlier when he found the contemplative and ethereal nature of Twachtman's painting related to Zen concepts, where the material was secondary to the idea. Twachtman was seen as creating an artistic Nirvana, and in capturing nature's soul; his work was viewed as quite distinct from that of his French colleagues. The emphasis upon the spiritual and the contemplative is not meant to suggest that Twachtman had retreated from the reality of the American art world; far from that. He taught at both the League and the Cooper Union, and was involved with most of the major art organizations in New York, not only exhibiting at the Society of American Artists and the Painters in Pastel but also with the New York Etching Club and the American Watercolour Society. He was a member of the Players along with many of his fellow artists. And he was instrumental in the founding of The Ten American Painters in 1898, although he only lived four more years; his place taken in 1902 by William Merritt Chase. In 1893 he refused to join his colleagues and friends J. Alden Weir, Robert Reid and Edward Simmons in the commission for murals in the Manufactures and Liberal Arts Building at the Chicago Columbian Exposition; his was an intimate, not a public art. But in 1894 he visited Buffalo and went on to paint a series of depictions of Niagara Falls, rendering it as a poetic vision rather than the traditional interpretation as a natural wonder. In turn, Major W.A.Wadsworth of Buffalo, who admired these, commissioned Twachtman to paint several views of Yellowstone, works mentioned by Theodore Robinson in his diary of 1895. Critics such as Eliot Clark felt that Twachtman was uninspired by the grandeur of Western scenery, and that he was an artist who responded more completely to humanized landscapes, but some of his Yellowstone views are quite monumental, incorporating a breadth of treatment and rich colouration with his still very personal vision. He may have been more secure, however, with his several views of the Emerald Pool at Yellowstone - bits of opulent colour, abstracting the curves of natural forms into the flat shapes and sinuous outlines that were unique to his aesthetic at the time. A fourth period in Twachtman's artistic career has been discerned by critics in the work done in his last years, 1900-2. During the summers of those years Twachtman painted in Gloucester, Massachusetts, along with his old mentor Duveneck, and another Cincinnati follower of Duveneck who was likewise transplanted to the East, Joseph De Camp (1858-1923). Perhaps partly influenced by them, a greater sense of geometric structure, stronger tonal contrast with the reintroduction of black, and more forceful brushwork returned to his art. These pictures from Gloucester, such as Italian Salt Barks and his last, unfinished work, Harbor View Hotel, were painted a premier coup - vigorously and immediately - and are not the result of great premeditation and the drying out of multiple layers of glazes over a heavy underpaint. Some of the paintings done at this time incorporate a strong rush back into space, and often a successful compositional integration of a clear and forceful two and three dimensional design. The compositions are also enlivened by contrast of active and empty areas, again an Oriental element. It is difficult to date Twachtman's work from even these few years, however, and their differences from his work of the previous decade are matters of degree, not changes in fundamental aesthetic manner as characterized the earlier artistic transformations. Though some of his last works take on occasional Munich characteristics, he did not return to a Munich manner. As to whether or not he might have developed a stronger and more vigorous approach to landscape painting had he lived is left to speculation only. Impressionist landscape paintings by John Henry Twachtman can be seen in the best art museums across America, notably the Cincinnati Art Museum. We gratefully acknowledge the use of material from the exhibition catalogue "American Impressionism" (published 1980, by Henry Art Gallery).  For biographies of other Impressionist artists in the United States, see: Famous Painters.  For more details of American Impressionism, see: Homepage.